It is planned to use the SportIdent Electronic Timing System for the Round Rotherham. For the competitor, this has the advantage of giving faster and more accurate results. For the organisation, we will have a more accurate record of who has passed which checkpoint and therefore better knowledge of who is still out - in the interest of your safety. Above (left): The SI card, carried by each participant. At each checkpoint and at the finish, this is 'dunked' in an SI box (right). The box has an internal clock and memory to record the time and serial number of each SI card that is dunked. 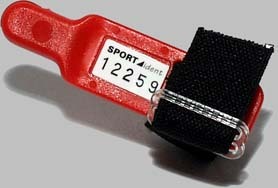 The SI card has a chip that records the time it was dunked at each box. At the finish, these times are read from the SI card. Times recorded in the boxes will be used to monitor progress of the event and to check for missing competitors. When you register at the Event Centre, you will be issued with an SI card. There will be a 'demo' area, where you can see how the system works. At each checkpoint and at the finish, you dunk the card the control box. The lights will flash, and the box will 'beep' to indicate that your SI card has been read. Once inside the Event Centre, the information is read from the card at a box linked to a computer. Results lists will be printed out at intervals. Safety Aspects: As long as your SI card is out, we will assume that you are still in the event. If you wish to retire, you must retire at a checkpoint or at the Event Centre by handing in your SI card, as per the FRA rules applying to this event. If this rule is contravened and the SI card is not returned, we will have to charge the replacement cost of the SI card.